— The number of potentially vulnerable Republican seats is growing, and we’re adding an extra 10 GOP-held seats to the Likely Republican column this week. — All of these members remain solid favorites for reelection, but at the same time, many seem likely to face better-funded challengers than they are used to. — There are scenarios in which Democrats gain many more than the 23 net seats they need to win the House this year — perhaps double that or even more — but their overall odds to take control remain about 50-50. 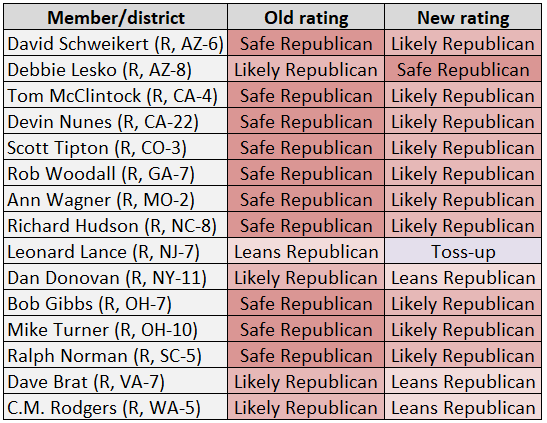 — Table 1 shows our 15 House ratings changes this week. Of those, 14 races move in a more Democratic direction, while Rep.-elect. Debbie Lesko (R, AZ-8) moves from Likely Republican to Safe Republican after her special election win on Tuesday night. Rep.-elect Debbie Lesko (R, AZ-8)’s victory in a special election Tuesday night fit into the pattern we’ve seen in other special elections this cycle. In a clearly Republican-leaning seat, Lesko won but ran significantly behind Donald Trump’s 2016 presidential performance. Trump won the district by 21 percentage points, whereas Lesko only won by about five points, based on unofficial results. Given the district’s strong Republican lineage, we thought any result in the single digits would be bad for Republicans. Lesko should be fine in the fall as an incumbent — and we’re moving her district to Safe Republican — but we now have had eight federal special elections this cycle in Trump-won, Republican-held seats (including the Alabama Senate election), and while Republicans have retained six of them, only one of those was an easy hold (UT-3). Granted, these specials all took place in open seats, and as a general rule open seats are harder to hold than ones held by incumbents. But Republicans are going to be on the defensive all over the country as they try to hold the House this year. This week, we’re adding 10 new districts to our list of competitive seats. We’re also making four other ratings changes that make some races already listed in our ratings more competitive. The most important one of these changes when assessing the likelihood of a House flip comes in New Jersey, where Rep. Leonard Lance (R, NJ-7) is now in a Toss-up race against likely Democratic nominee Tom Malinowski, a former State Department official. Lance represents a very affluent and highly educated district — NJ-7 is fifth among all 435 districts in median income and is one of the relatively few districts nationally where a majority of residents 25 and older hold at least a four-year college degree. Given Donald Trump’s poor performance in similar districts across the country, it is probably no surprise that NJ-7 voted for Hillary Clinton by a point after Mitt Romney won it by six in 2012. In the context of generally strong GOP House results across the country in 2016, Lance’s 11-point win over an unheralded challenger was somewhat weak, and Malinowski will be well-funded. The Garden State is a key to Democratic House hopes: NJ-7 joins NJ-11 in the Toss-up column, and the open NJ-2 already Leans Democratic in our ratings. Democrats have seemingly strong candidates in all three districts and they have a good chance to net at least two and quite possibly more seats from the state. — In VA-7, Rep. Dave Brat (R) sprung one of the great upsets in primary history in 2014 when he defeated then-House Majority Leader Eric Cantor (R). But Brat’s district probably is not as hard right as he is (he’s a member of the very conservative House Freedom Caucus), although the district includes rural parts of Central Virginia that in most years would outvote the more Democratic parts of the district in Greater Richmond. Like other suburban districts with higher-than-average education levels, Trump underperformed there, winning by 6.5 points, a few points down from Romney in 2012. In the recent Virginia gubernatorial race, the GOP edge was cut further, as Ed Gillespie (R) carried it by a little under four points. Democrats seem likely to have a credible nominee, either former CIA agent Abigail Spanberger or Marine veteran Dan Ward. — Staten Island, one of the most conservative urban areas in the country, would seem like the capital of Trump country, and Trump ran close to 15 points ahead of Romney’s margin in NY-11, which covers Staten Island and Brooklyn neighborhoods like Bay Ridge and Bensonhurst. The district’s current congressman, Rep. Dan Donovan (R), is a former Richmond County (Staten Island) district attorney, and he is hardly a Trump-like figure in terms of style. But Michael Grimm (R), Donovan’s predecessor, is, and he wants his seat back after he pled guilty to a tax fraud charge and resigned in January 2015. Grimm has attacked Donovan for not being sufficiently loyal to the president, and the Democratic Congressional Campaign Committee gleefully released a poll recently showing Grimm leading by 10 points in the primary. Even if the poll isn’t accurate — the DCCC has an agenda here and would prefer Grimm to be the nominee — Grimm seems likely to push Donovan, and Democrats have another well-heeled candidate with a military background, Max Rose, waiting to face the eventual primary winner in a district that the party has held in the past. — Finally, a recent nonpartisan poll showed Rep. Cathy McMorris Rodgers (R, WA-5), the no. 4 House Republican in leadership, up only single digits on Lisa Brown (D), a former state Senate majority leader and university chancellor. Eastern Washington is definitely a Republican area — Trump won this district by 13 points — but Brown is probably the strongest opponent McMorris Rodgers has faced. Of the 10 previously Safe Republican members who we are moving to Likely Republican, the majority of them were elected in 2010 or after, meaning that they’ve never had to run in a Democratic-leaning national environment. The midterms of 2010 and 2014 were Republican wave environments, and 2012 and 2016 were effectively neutral years in the House despite big shifts at the presidential level in nearly half of all districts in 2016. This year should feature the best Democratic environment since 2008. The size of that Democratic lean is yet to be determined, but certainly there are signs (such as election results so far this cycle and national House polling) that it could be pronounced. Even before Lesko’s underwhelming victory in AZ-8, Republicans were starting to sound the alarm on another typically Republican suburban Phoenix seat, held by Rep. David Schweikert (R, AZ-6). Schweikert was first elected in 2010, when he beat Rep. Harry Mitchell (D), and he then defeated Rep. Ben Quayle (R) after redistricting forced them into a member vs. member primary in 2012. Schweikert’s district is heavily Republican, but Trump only won it by 10 points after Romney won it by 21. If AZ-8 could be competitive, AZ-6 could be as well. In Ohio, Reps. Bob Gibbs (R, OH-7) and Mike Turner (R, OH-10) may be pushed this year. Gibbs’ challenger, veteran Ken Harbaugh (D), has proven to be an excellent fundraiser, and there are some whispers that Gibbs may be more endangered than one might expect in a northeastern Ohio district that Trump carried by nearly 30 points. One added wrinkle in this race is that, in what seems to be an increasingly common tactic nationally, Gibbs and Ohio Republicans seem to be trying to play in the Democratic primary by boosting Harbaugh’s little-known opponent. Turner, a former Dayton mayor who has been a very strong electoral performer — his district clearly leans Republican but it is more competitive than his easy reelection margins indicate — has had to deal with an ugly recent divorce, and businesswoman Theresa Gasper (D) outraised him last quarter. Other suburban Republicans who may have harder-than-usual races include Reps. Ann Wagner (R, MO-2) and Rob Woodall (R, GA-7), who represent suburban St. Louis and Atlanta, respectively. Democrats see some opportunities against Wagner, although she is sitting on a giant warchest. Woodall is not, and the same factors that made last year’s GA-6 special very competitive may also be affecting GA-7, although Woodall’s district is more Republican-leaning (Trump won GA-6 by just 1.5 points but he won GA-7 by six points, although both performances were very poor historically for a Republican presidential candidate in those districts). Rep. Devin Nunes (R, CA-22), who has become nationally famous thanks to his roles as a defender of President Trump and chairman of the House Intelligence Committee, sits in another historically Republican district where Trump fared poorly compared to Romney, although he still carried it by 9.5 points. Nunes newfound notoriety cuts both ways — he’s raising a ton of money but so is his prospective November opponent, Andrew Janz (D), a Fresno County deputy district attorney. Also coming on to the board is Rep. Tom McClintock (R, CA-4), who sits in a suburban Sacramento district Trump won by about 15 points but likely will have a credible challenger in November. McClintock also barely won the last time he ran in a Democratic year, 2008, so there is some history of competition even in this typically Republican area (although McClintock was not an incumbent then). June’s all-party primaries in California should give us some clues about the competitiveness of these and other districts; for instance, a surprisingly close result in the June 2016 primary suggested Rep. Darrell Issa (R, CA-49) was vulnerable. He barely won in November and is now retiring. There is also a chance that two members of the same party may advance to the general election in some districts that otherwise would have been competitive in the fall. Staying out west, Rep. Scott Tipton (R, CO-3) represents the Republican but often competitive Western Slope of Colorado, and while he won impressive reelection victories against touted opponents in 2012 and 2016, he has to deal with a tougher environment this time. Finally, we’re adding two members who represent districts that contain some of suburban Charlotte on opposite sides of the border between the Carolinas: Reps. Richard Hudson (R, NC-8) and Ralph Norman (R, SC-5). Norman narrowly won a special election last year, and both members need to be on guard against a Democratic bounceback in territory that had Democratic House members relatively recently but also comfortably supported Trump. Remember: Most members of Congress aren’t really pushed at all, either in a primary or a general election. The Republican members listed in the likely column are still, in our judgment, very clear favorites in the fall. It’s just that they won’t be able to totally coast like many of their colleagues and, if everything breaks right for the Democrats, one or more of them may lose. Overall, our House outlook remains the same: Democrats are about 50-50 to win the House. What these ratings change do is make clear that in the event of a big wave, there are some districts that might not seem competitive on paper that could flip, particularly because a deep bench of Democratic candidates is in place to capitalize on a potentially great environment in the fall. That’s where one could see Democrats picking up substantially more than the 23 net seats they need to win House control. However, the Democratic wave could fail to materialize, and Democratic gains could be limited to the teens. At this juncture, the range of possibilities in the House is wide. We realize that may be an unsatisfying and overly cautious assessment, but that’s where we’re at right now with the election still half a year away. In total, we have 211 House seats rated Safe/Likely/Leaning Republican, 198 Safe/Likely/Leaning Democratic, and 26 Toss-ups. Splitting the Toss-ups evenly, 13-13, would lead to a 224-211 Republican House, a 16-seat Democratic gain from the current House, which is 240-195 Republican assuming no vacancies. When we talk about a “floor” for Democratic gains, a gain of about 10-15 seats for the Democrats seems to be about the lowest we would expect barring a massive change in public opinion. Sometimes in elections there is a debate about expectations. For instance, one might credibly argue that Democrats would do well in the Senate if they just didn’t lose any net seats given their very challenging map this year. Such an outcome would still leave Republicans in the Senate majority, though. However, in the case of the 2018 battle for the House, there’s no need to discuss what a moral victory might look like for either side: Whichever side gets to elect the speaker next year had the better election, period. That means that even if Republicans lose, say, 20 seats, they still would have had a good election given this year’s difficult circumstances.